Great items! I love the pink candy. Happy blogging. Those pink gum balls look delicious!! I have been wanting the "For Like Ever" Poster for so long =) Great list! Love those pink gumballs. Perfect for Valentines decorations. These all make me smile! 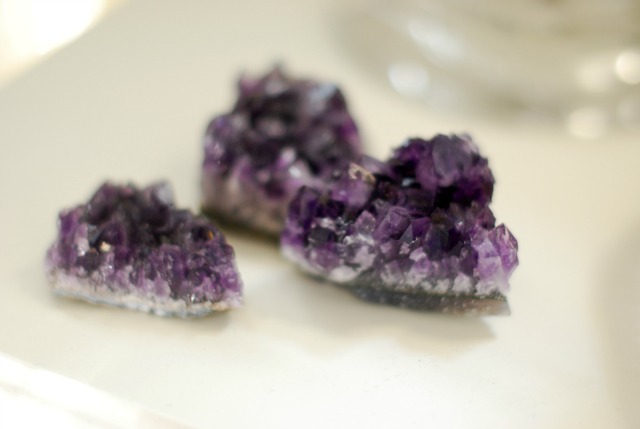 The amethyst stones are so pretty! I would love one for a paper weight. I love that it's the simple cute stuff in your place that make regular stuff look so fun. 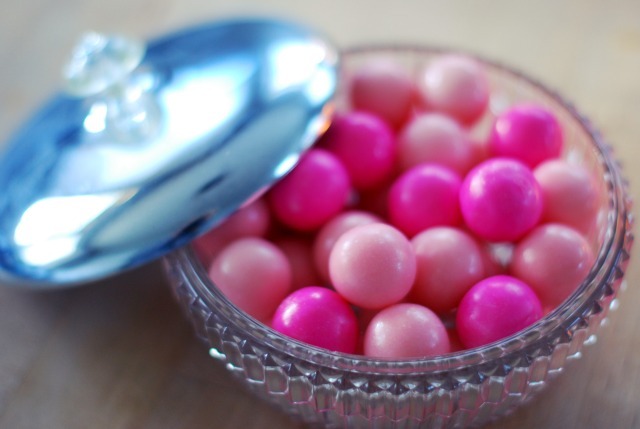 You should use those gum balls for your wedding! Isn't pink one of your colors?? That pig is so unbelievably cute! Love, love, love the little piggy! Lovely things! 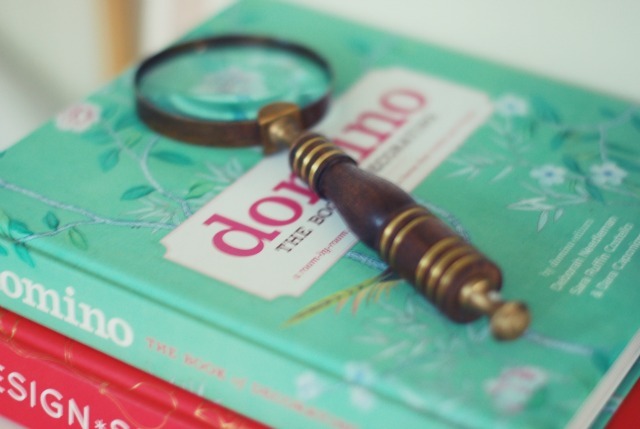 I adore that magnifying glass. Very chic and different. That gold pig is TOO CUTE! I love these photos! Especially the pink gumballs and the gemstones. So pretty! So many lovely things! I especially love the magnifying glass and candy display, so cute! This is one of my favorite kinds of blog posts to look at. I have a little gold pig as well (mine is a piggy bank however). I especially like any pretty candy storage/display. But it would never last with me. I just love candy too much! 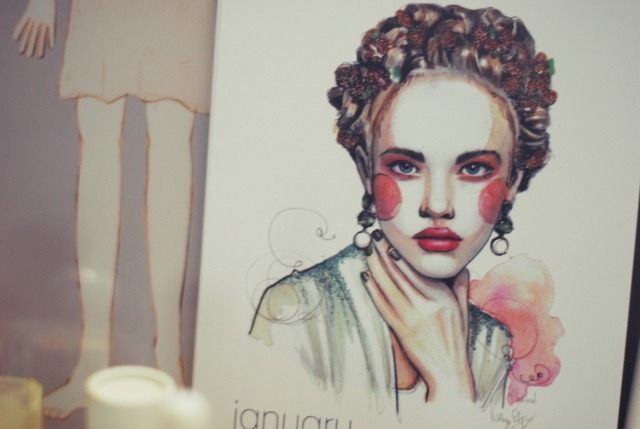 The Paper Fashion calendar also looks really, really pretty. I love the pink gums, such a cute decoration idea! Very cute details! I'm especially loving the pink gumballs... so simple yet I love it! This post is an inspiration. This is the kind of blog I want to read with my coffee to start my day. Thanks! Even with such little details, I can get a sense of the atmosphere in your home. It's lovely! love the pig! where did you find you frame for your for like ever print? Everything here is so feminine and pretty. I've been dying to get that print, but haven't found it anywhere. i want one of those piggy banks so bad! all lovely photos. i love the golden pig how silly! That gold pig is awesome!! Love the pink gumballs in the bowl! So fun! I love this "things that make me happy" post! 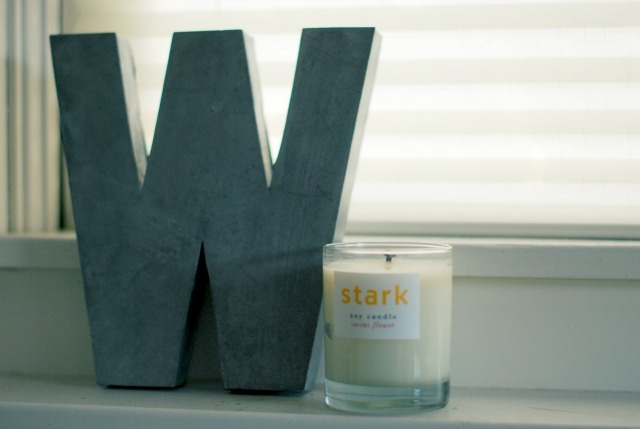 Great things for home decor. Have a great weekend! I love all these things- the little things are what make you smile the most. Especially that pig- how cute is that?! And I LOVE that calendar. I'll have to see if I can get it. 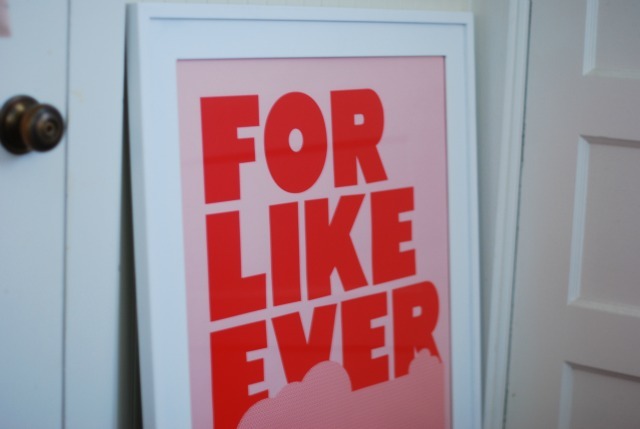 I adore this "For Like Ever" poster. It'd be great in an office. Love the gold pig what a weir and fresh idea and that ping gums you just return me back to my childhood. I havent visited your site in a while. I like the makeover! lovely photographs! the illustrations in the calender are beautiful and the framed 'for like ever' poster is pretty great! Too crazy...when I saw the third image, I actually thought it was from my apartment! I have the same two books stacked in the same order on a side table in my living room and just posted an image of them last week (http://www.secondfloorliving.net/2012/01/tour-my-apartment-part-1-living-room.html). I've had a crush on that pig for the longest time. I should really just buy it! It's been about four years now! And your engagement session from a few posts earlier is so sweet! Congrats again! i LOVE gum balls!! and the pink ones are so pretty !! i love to see shots of beloved items! this whole posts makes me smile!! I really want the little piggy! 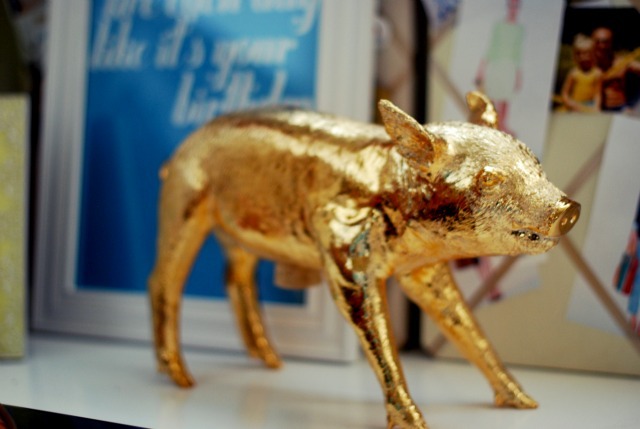 Golden pig is seriously really funny but it will look great as a decoration on some of my shelves.